“Non c’è due senza tre” is an Italian proverb which means if you do something twice you’re bound to do it a third time. 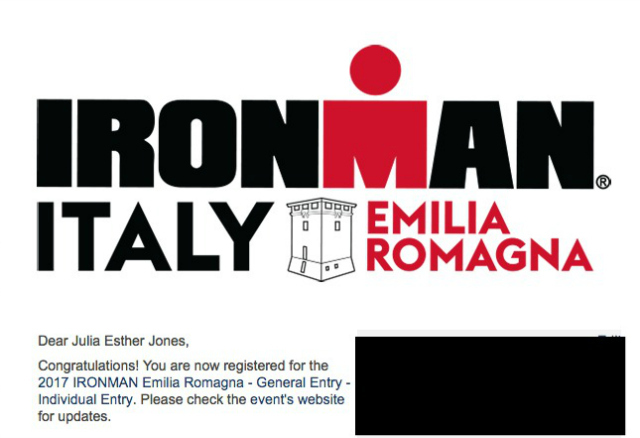 Yesterday I signed up for my third Ironman, IM Cervia in Italy. There are a few long distance triathlons in Italy, one is even really well organised which is kind of a shocker for this country. But this will be the first Ironman brand (®!) long distance race and I wanted to be a part of it. It took me awhile to sign up and I didn’t get the push to do it until I saw they were at 80% capacity. If I wanted to be at the starting line in September I needed to get that credit card out! But before doing so I had to resolve a little dilemma going through my brain: why was I doing this? I still think swimming 3.8km, peddling 180km and topping it off with a marathon is one of the craziest (senseless?) sporting events out there, so why do it for a third time? After another ten days of hemming and hawing here’s what I came up with. The idea of an Ironman still excites me. Ever since they published details about the new IM Cervia I’ve had it on my mind. It’s in September and in my imagination I already had training pals lined up and summer vacation scheduled around bike routes. I love that exciting and consuming feeling I get about a race. Others may get it when planning on going to a rock concert or a certain restaurant, for me anything with the words “triathlon”, “marathon”, or “endurance” will do it. I never sign up for anything unless I have have this feeling – you need it when the training gets tough. I still have unfinished business after the last one. Don’t get me wrong, my experience at Ironman Barcelona was perfect on it’s own. I learned many a lesson there and I wouldn’t trade it for anything in the world. But I want and need to go back and do it differently. Life has taught me that it won’t necessarily be perfect and anything could be thrown at me in the meantime. I need to get back on the bike and not be scared of it anymore. Training for such a big event forces me to really look at what keeps me healthy. The truth is that if I didn’t swim, bike and run I’d be sitting on the couch popping bonbons and watching the new Netflix series. Oh, and knitting. I have a newfound love for knitting. When I don’t have anything on the agenda I do a lot of the aforementioned activities. When I have a bigger than life sports event I ask myself if I’m getting enough sleep, if my eating is going to fuel the bike run I have planned for the afternoon. I rolled this one over in my head the longest. I kept asking myself, “Aren’t you capable of just taking care of yourself without any sports event on the horizon?” In the end I decided that the answer to that question didn’t really matter. Maybe one day I’ll know the answer but for now sleeping 8+ hours last night was a direct result of my signing up for the Ironman event. Training starts today! I love training with purpose. So far 2017 has sucked as far as my health is concerned. I’ve gotten the flu three times and we haven’t even gotten to spring! I am still going to the Boston Marathon in April and I know that if I hadn’t signed up for it I would have given up on running by now. With the big M on the horizon I just kept believing and getting back out there after each fever had subsided. I’m still training but my focus is more on the fun I’ll have with the group I’m going with, rooming with my bestie Patrizia and seeing old friends (Hi Bart! Hi Kathrine! Hi Jonathan!) in Boston. Oh, and the one week vacation afterwards driving around Cape Cod. That in itself is worth all the training in the world. Yeah, yeah, you're just a glutton for punishment! :P Can't wait to go along for the ride!